Based on the classic Francis Ford Coppola film, The Godfather: Corleone�s Empire plunges players into the world of crime and corruption in New York City. In The Godfather: Corleone�s Empire, 2 to 5 players assume the head of different crime families all fighting for territory. Over the course of four acts, they will hustle businesses, bribe city officials, and assassinate opponents. Whoever has acquired the most money by the end of the final act will be named the new Don. Make an offer they can't refuse! 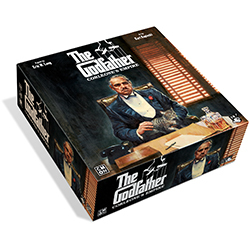 Preorder The Godfather: Corleone�s Empire (CMONGDF001) and the Pre-Release Kit (CMONGDFPR01) now!